The Stanford Dolman Travel Book of the Year prize for 2018 was awarded recently to Kapka Kassabova for her book Border: A journey to the edge of Europe (Granta). The prize is one of those offered in the annual Edward Stanford Travel Writing Awards, which includes prizes for adventure travel books as well as for Travel Blog of the Year. The awards are named after Edward Stanford, who founded in London in 1853 what has gone on to become the world’s largest specialist map and travel bookshop. Border describes the author’s travels in the region where Bulgaria, Greece and Turkey meet; an area that has been an important frontier zone for centuries — from the time of the Ottoman Empire, through to the Cold War, and even today as the “edge of Europe”. The author spent her early years here at the end of the Cold War, when Bulgaria lay behind the iron curtain and many people attempted to flee across the border into Turkey or Greece. The powerful presence of that border seems to have influenced Kassabova’s work throughout her life — as one reviewer describes: “In her travel writing, memoirs and poetry, a running theme is what borders do to the individual and collective human psyche.” This focus was praised by judges as being “highly topical” at a time when “Europe stands once more on the cusp of change.” Indeed, this was not the only book on the Award’s short-list of seven titles to have borders as a central theme. In The Rule of the Land (Faber) author Garrett Carr describes his walk along the frontier between the Irish Republic and Northern Ireland – a long-fraught border which has gained extra significance in the wake of the Brexit vote. 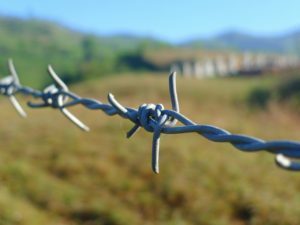 Borders may seem particularly topical in the West now, given popular concerns about immigration and calls to ‘harden’ national boundaries (including Trump’s threatened Mexican wall); but all over the globe borders profoundly impact those who live near them, or who want or need to travel across them. We are a species that has mostly settled into a sedentist existence of territories and nation-states, and yet we retain the desire, and often the need, to travel. Perhaps borders are an inevitable consequence of our sedentism — although how those boundaries are controlled is of course contingent – and they hold an important place in our cultural imagination. Borderlands and frontiers are often thought to be different in some way — wilder, less known — and the people of those lands may have a similar reputation. In his book on walking the Irish border, for example, Carr divides Ireland into three: north, south and the borderland, which has its own people and language. These two books exemplify how travel literature not only describes places, or journeys, but can also explore wider issues, including political, cultural and psychological themes. Indeed, the forms of travel literature can be so broad and varied that academics studying the field have had some difficulty in defining as it as a genre. Whatever the exact definition, travel writing has a very long history, “as old as fiction itself”, according to Professors Peter Hulme and Tim Youngs. Its enduring popularity may in part be because it gives the reader access not only to distant lands and exotic cultures, but also allows us to reflect on our own cultures and selves — just as travel itself does, but in a more convenient form! Travel literature can tell us a great deal about why we travel, what motivates us and what we gain from the experience, as well as about the impacts that travel – and travel restrictions – can have on our social, political and inner lives. For this reason, an examination of travel literature is an important part of the Independent Transport Commission’s Why Travel? project, which aims to better understand the motivations that drive travel behaviour. The project examines psychological and biological drivers of travel as well as the economic, cultural and social structures we have created that all enable, control and shape our travel behaviour. Ultimately, this deeper understanding will help us to make better decisions in future regarding human travel and transport, and the myriad areas of life which travel influences. For more information on the project, including news and expert views, see www.whytravel.org.